Sift Maizena and flour together, add the castor sugar. Rub the butter into the dry ingredients and knead until a stiff dough is formed. Press the dough into either a 23 cm diameter quiche tin or a 20 x 29cm baking tray. Mark the slices lightly and prick with a fork. Bake at 160ºC for an hour. 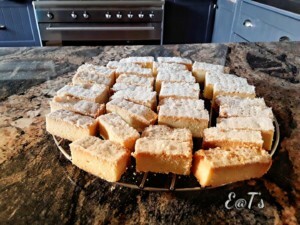 Allow the shortbread to cool in the pans before cutting and removing from pans. Drench the shortbread with additional castor sugar. As this recipe is not a big quantity to make, I double the recipe and press into a 27 x 37cm oven pan (the one that comes with the Defy ovens).